The Doubletree Park Place Hotel has a special relationship with Peter Hobart Primary Center. This fall four of their employees volunteered weekly with the Start the Day Reading program. The hotel employees worked with first through third grade students for an hour before school. Through the program, students have the chance to develop their reading skills by reading to caring adults. Amanda Martinson, Doubletree’s human resources coordinator said her involvement is inspiring. “I can tell in their faces when they look up at me how much they appreciate this,” said Amanda. Other Doubletree volunteers are Sandy Buonanni, general manager, Rania Hammad, group & revenue coordinator and Brenna Ramy, human resources director. At the conclusion of the program, students and their teacher are invited to the hotel to read for employees and partake in lunch and a hotel tour. Start the Day Reading is an extension the Doubletree’s five-year involvement at the school through the hotel’s Teaching Kids to Care project. Each spring and fall hotel employees work with the school on a special project such as a can recycling can collection or food drive. 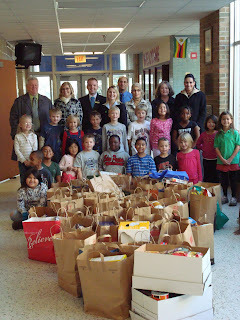 In November the students gathered 1,000 lbs. of food for the St. Louis Park Emergency Program (STEP). Photo: Employees from the Doubletree Park Place Hotel and students from Peter Hobart Primary Center gather by food they collected for STEP.